Has Santa come early for cattle producers? Regardless of the underlying cause, the rally provided some much-needed reprieve for cattle feeders. Call it what you like – Santa rally, Trump rally, whatever – the cattle market has rallied and we’ll take it. And while it certainly won’t bail out long-running concerns around equity drain, sellers were finally able to enjoy an extended run on the positive side of weekly negotiations. As such, regardless of the underlying cause, the cattle market rally provided some much-needed reprieve for cattle feeders. As review, October’s final week of trade jumped the market back to $104-$105 per cwt after trading mostly $98-$100 during the previous two weeks. The first half of November followed right in line around that level. But then the market woke up in the back half of November and strung together three consecutive weeks of better trade: $108, $111, and $114, respectively. With that occurrence, November’s favorable market managed to pierce through the downward channel and broke an important streak (Figure 1). As noted last month, even with better trade at month’s end, October marked a string of seven consecutive months of lower month-over-month trade. November is the first time since March the monthly average was better than the previous month. Back to the source of the rally, much of the fed market’s strength is directly attributable to better prices on the wholesale side. The Choice cutout bottomed in mid-October around $180 per cwt. Just several weeks later, though, at the beginning of November, holiday demand finally kicked in, spurring the cutout back up to $187. And after chopping around the mid-$180 range for several weeks, post-Thanksgiving trade finally had the cutout above $190 per cwt for the first time since September. Meanwhile, USDA’s November Cattle on Feed report was largely in line with pre-report expectations; accordingly, traders absorbed the report as being mostly neutral to slightly bullish. Feedyard inventories were marked at 10.67 million head – 1% lower than last year and 3% behind the 5-year average. The report’s most favorable aspect came on the marketings side. Feedyards have been active sellers; October weigh-ups equaled 1.7 million head – 5% ahead of 2015. That action has trimmed the 120-plus day inventory to 3.34 million head on November 1 versus 3.65 million head last year. Therefore, feedyards have improved currentness and garnered some support for weekly negotiations going forward, at least over the short term. However, a note of caution: November’s 120-plus day on-feed number is the third-largest November mark in the series history – behind only 2012 and 2015. Nevertheless, better boxed beef sales, a favorable Cattle on Feed report and higher fed cattle sales had CME traders jumping on the wagon, too. The December contract found its way back to $110-$111 near the end of November; a steady grind higher from the near-term low around $100 established early in the month. Based on action occurring at the end of November, traders seem content (at least for the time-being) to let the front-end contract chop around $108-$111. Therefore, it’ll likely take some fresh positive news to spur another leg up. Perhaps the most important focus for now, at least from a futures perspective, is on the back end of the board. 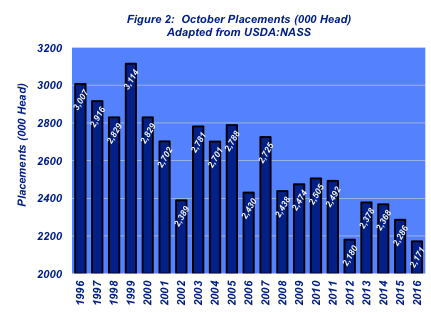 This year’s placements represented the smallest October arrivals in USDA’s Cattle on Feed report history. October placements totaled only 2.17 million head – 5% less versus 2015 and 7% fewer head compared with the five-year average (Figure 2). That comes on the heels of smaller September placements, too. In theme with last month’s discussion, to date, 2016 placements are only 673,000 head bigger compared with 2015. And recall, the starting feeder cattle inventory was 1.3 million head larger than 2015. 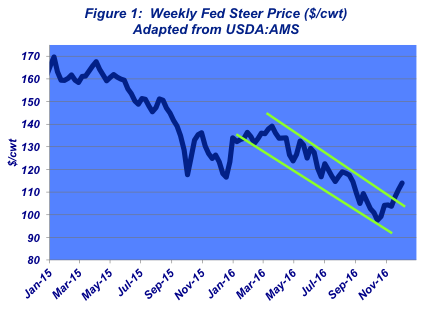 In other words, the feeding sector has only placed about half that initial feeder cattle inventory. That said, uncertainty remains around the size and composition of the feeder cattle inventory out in the country. First, due to changing packer preferences, some Holsteins may never make their way to the feedyard and shouldn’t be included in the total count. Second, there’s seemingly a mounting inventory of feeder cattle that will need to be reckoned with – that includes both cattle that haven’t been placed in 2015 along with the additional 2016 spring-born calf inventory that’s bigger than 2015. There’s been lots of speculation in 2016 about how northern tier feeders will adjust to market conditions in the fall run. November’s Cattle on Feed report saw 815,000 head collectively landing in Nebraska, Iowa, and South Dakota – that represents about 38% of total placements – right in line with October in recent years (Figure 3). On one hand, there’s a camp that contends smaller feeders will become frustrated by the market and simply throw in the towel. On the other hand, there’s a side that argues plentiful feed will keep cattle moving to the north. Apparently, the latter argument appears to be winning for now. I recently wrote an article for Feedstuffs titled, “Right attitude helps in market, business decisions.” In that column I noted, “The absence of a meaningful plan leaves decision-making susceptible to emotion, especially negative, non-constructive emotion…” That’s particularly important when marketing decisions are influenced by downward market pressures. Obtaining objective information and following up with meaningful analysis is critical to making good decisions. Consistent with that theme, producers are encouraged to remain vigilant about understanding risk management of all kinds and establishing a pre-determined marketing plan. In combination, those are critical steps to ensuring successful decision making for the operation.